When a tooth or multiple teeth are missing, there are a few options for the patient to replace it/them. Two of the most common choices are either by fabricating a bridge, or a removable partial denture (RPD). These two are different in terms of aesthetic and functional aspects, and hence, they have their own indications, as well as advantages and disadvantages. What is a bridge and how is it done? A bridge is a prosthesis that is fixed onto the teeth at the end of the edentulous space, which is also known as the abutment teeth. These abutment teeth are cut all around , removing around 1mm to 2mm of sound tooth structure, and also from the occlusal surface (the surface where we use our teeth to chew and grind our food). Depending on the material used to fabricate the crown, the amount of tooth structure that needs to be removed will be different. If porcelain is used, more tooth structure will need to be removed (1mm to 2mm) because porcelain needs a thicker bulk to get their strength. However, if metal is used, less tooth structure needs to be removed (0.8mm to 1mm) as metal is stronger then porcelain. Sometimes, a porcelain fused metal (PFM) crown is used, where porcelain is used on the buccal surface, and metal is used on the occlusal and lingual surface. In this case, the tooth structure removal is done accordingly. After satisfactory tooth structure removal has been done (this process is also known as tooth preparation), an impression will be taken, and the impression will be sent to the lab for bridge fabrication. After the prosthesis is done, the bridge will be sent back to the dentist and it will be luted onto the prepared teeth using a luting cement. 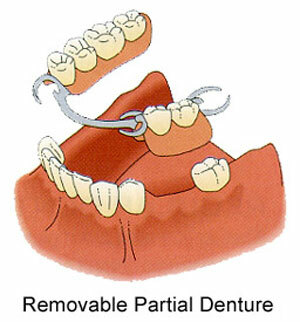 What is a removable partial denture and how is it done? A removable partial denture is a prosthesis that sits into the edentulous spaces, and require only minimal tooth preparation, sometimes none at all, which is the first difference between it and the bridge. As the name suggests, it is removable, and that is the second difference. 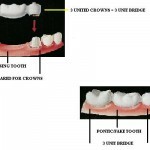 The clinical procedure to fabricate the removable partial denture also differs from fabricating a bridge. A removable partial denture needs more visits as after tooth preparation is done, an impression needs to be taken and then the patient has to come back for the bite registration and try in procedure, and only then, can the patient get the removable partial denture. 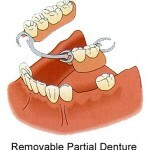 What is the difference between bridge and removable partial denture? 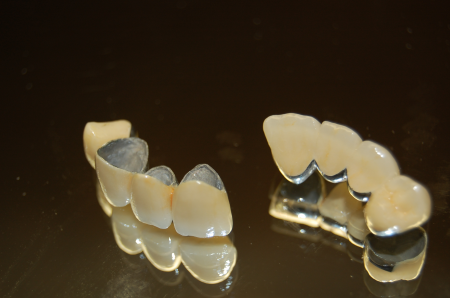 As a bridge does not use clasps for retention, as do a removable partial denture, it is more aesthetic. A bridge can also mimic a tooth’s shade exactly from the incisal tip to the cervical region, which an acrylic teeth used to set onto the removal partial denture cannot. However, a bridge is not able to replace too many missing teeth, unlike removable partial denture which is able to replace any amount of missing teeth. The maximum amount of missing posterior teeth that can be supported by the bridge are two, and the maximum amount of anterior teeth are four. 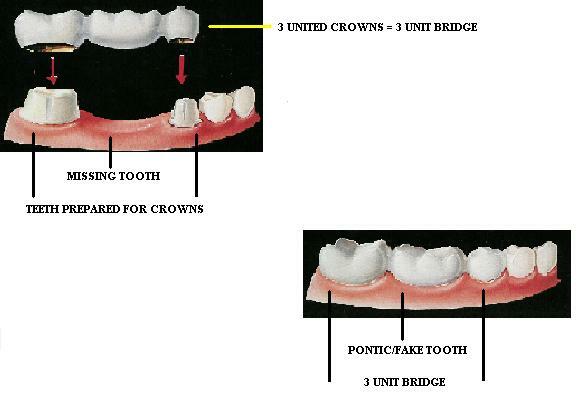 This is because the bridge relies on the abutment teeth for retention, and if the bridge is used to replace too many missing teeth, the forces applied on the abutment will be too great, which will inevitably lead to loosening of the abutment teeth. However, for the removable partial denture, it can also derive its retention from clasps, abutment teeth, and the alveolar bone, therefore, less forces will be put on the abutment teeth. However, if the abutment teeth is loose, it is not wise to go for a bridge fabrication even if there is only one missing posterior or anterior tooth, as the forces placed on the abutment teeth will worsen the loosening of the teeth. There are also other various factors which influence the decision of whether to use a bridge or a removable partial denture to replace the edentulous space, such as the crown root ratio, the root shape, and the occlusal-gingival height. The cost of both the prosthesis is also different, with the bridge being more expensive. However, for an old patient to cope with a new removable partial denture is sometimes difficult, therefore, it is better to give a bridge if the condition allows. 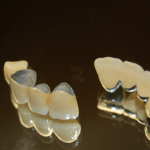 The indications stated in this article are for the readers to have a general idea which prosthesis will suit them better, either a bridge and a removable partial denture. However, readers must bear in mind that the dentist who is seeing the oral cavity and the teeth clinically will have a better idea which prosthesis to use. If there is any doubt about the decision made by the dentist, the patient should never hesitate to ask further and understand better.